November 10th 1847; the passenger ship Stephen Whitney is wrecked in thick fog off the southern coast of Ireland, killing 92 of the 110 on board. The disaster results in the construction the Fastnet Rock lighthouse. Fastnet Rock (from Old Norse: Hvasstann-ait meaning "sharp-tooth ait" — called in Irish: Carraig Aonair, meaning "solitary rock / lone rock") is a small clay-slate island with quartz veins and the most southerly point of Ireland, 6.5 km southwest of Cape Clear Island (Oileán Chléire) in County Cork, which is itself 13 km (8 miles) from the mainland. It lies in the Atlantic Ocean 11.3 km south of mainland County Cork, at latitude 51.37°N. It rises to about 30 m above low water mark. Divided into Fastnet Rock proper and the much smaller Little Fastnet to the south by a 10 m (30 ft) wide channel, it also had the nickname 'Ireland's Teardrop' as it was the last part of the country seen by Irish emigrants to the United States in the 19th century as they sailed past it. The Fastnet Rock is used as the midpoint of one of the world's classic offshore yachting races, the Fastnet Race, a 979 km (608 mile) round trip from Cowes, UK round the rock and back to Plymouth. It is also used occasionally as a mark for yacht races from local sailing centres such as Schull and Baltimore. 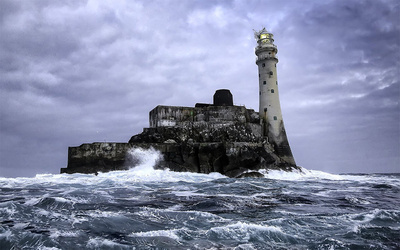 Fastnet Rock gives its name to a sea area used in the Shipping Forecast on BBC Radio 4. The current lighthouse is the second to be built on the rock and the highest in Ireland. Construction of the first one started in 1853, and it first produced a light on 1 January 1854. The lighthouse replaced an early one built on Cape Clear Island in 1818, partly motivated by the loss of an American sailing packet, Stephen Whitney, in thick fog during November 1847 on nearby West Calf Island causing the death of 92 of her 110 passengers and crew. The new lighthouse was constructed of cast iron with an inner lining of brick and was designed by George Halpin. Costing £17,390, the tower was 63 feet 9 inches (19.4 m) high with a 27 feet 8 inch (8.4 m) high lantern structure on top, giving a total height of around 91 feet (27.7 m). It had an oil burning lamp of 38 kilocandelas; in contrast modern lighthouses typically produce 1,300 kilocandelas. In 1883 an explosive fog signal was installed, which electrically detonated a small charge of guncotton every five minutes in fog. The tower proved to be too weak, since gales shook it to the point that crockery was sometimes thrown off tables, and a 60 imperial gallon (273 L) cask of water lashed to the gallery 133 feet (40.5 m) above high water was washed away. Various steps were taken to strengthen the tower, including fitting a casing around the bottom section up to the second floor and filling it with stone, and the surrounding rock smoothed over. In 1865 the lower floors were filled in with solid material. In 1891 the Commissioners of Irish Lights had resolved that the light was not sufficiently powerful, particularly for the first landfall for many ships crossing the Atlantic. The replacement was constructed of stone, cast iron now being considered unsatisfactory — the whole of the nearby Calf tower above its strengthening casing had been carried away during a gale on 27 November 1881, although without loss of life. On the same day, the sea had broken the glass of the Fastnet Rock lantern. The new lighthouse was designed by William Douglass and built under the supervision of James Kavanagh. Construction started in 1897 with the levelling of the site, and the first of 2,047 Cornish granite dovetailed blocks was laid in June 1899. As well as these blocks, weighing 4300 tons in total and with a volume of 58,093 cubic feet (1645 m³), a further 4100 cubic feet (116 m³) of granite was used to fill the inside of the tower up to the level of the entrance floor 58 feet (17.7 m) above high water mark. A small steamship, the Ierne, was specially constructed for carrying the blocks out to the island, and Kavenagh personally set every stone, which weighed between 1.75 and 3 tons. The new lighthouse entered service on 27 June 1904 having cost nearly £90,000. The masonry tower is 146 feet (44.5 m) high, with the focal point of the light 159 feet (48.5 m) above high water mark. The base of the lighthouse is 52 feet (15.8 m) in diameter with the first course of stone 6 inches (150 mm) below high-water mark, and the first ten of the 89 courses built into the rock. The first floor of the original tower remains, on the highest part of the rock, having been left when it was demolished and converted into an oil store. The fog signal was changed to one report every three minutes in 1934 and from 1965 accompanied by a brilliant flash when operated during darkness. The original vaporised paraffin light was replaced with an electric one on 10 May 1969. At the end of March 1989 the lighthouse was converted to automatic operation. It is monitored and controlled using a UHF telemetry link to Mizen Head Lighthouse and onwards by landline to the control centre at Dún Laoghaire. It produces a 0.14 second long white flash every five seconds, with a nominal range of 27 nautical miles (50 km) and power of 2,500 kilocandelas. Since April 1978 in addition to being operated during darkness, the light is also used during poor visibility when the fog signal is sounding. The explosive fog signal was replaced with an electric fog horn in 1974 which produces 4 blasts every minute at 300 hertz with a nominal range of 3.9 nautical miles (7 km). The Racon—radar transponder beacon—has been a morse G on the radar display since its installation in 1994. In 1985, the lighthouse was struck by a rogue wave measuring about 48m in height. In the Summer months a Cape Clear based ferry runs trips around the rock from Baltimore and Cape Clear.